Despite Muslims in America professing they assimilate, and obey the law of the land as commanded by their religious doctrine, they continue to undermine and destroy it with every opportunity. Unfortunately, they have the assistance of leftists, and those who hold ideals antithetical with the Constitution. On January 25th 2018, Tennessee Gubernatorial candidate Mae Beavers was set to host a Homeland Security Summit,featuring 3 speakers, each an expert on different facets of Islamic infiltration and indoctrination. The venue was set to be at Trevecca Nazerne University, a Christian school in Nashville TN. As soon as information regarding the summit was released for ticket sales, Islamists and their leftist underlings began their typical tighten the noose campaign, to shut down the event. Ibrahim Cooper, head spokesman for the terror organization CAIR/Hamas intermediately used their pawn the Tennessean newspaper to publish a negative article which led to banks and other weaklings to call Dan Boone, the president of Trevecca College and pressure him to remove the event from the campus. Obviously, Mr. Boone caved to the Islamists and others. For those who will say Sharia law does not exist within the United States because of our Constitution, you are sadly mistaken. While it may not be used in a Constitutionally challenged way, it is being used to suppress anything Muslims believe is against them. Every time an accommodation is made for a Muslim outside of the normal and accepted realm of our society, it is Sharia. In addition to the ruling on democracy, anything or anyone that speaks ill of the Prophet Muhammad or Islam is considered blasphemous, and can be killed. This is exactly why Muslims suppress any speech that opposes their antiquated, violent ideology. Educating Americans on the truth about Islam and the goal of its Prophet is contrary to what a Muslim will tell you. This is why Muslims in Tennessee stifled those that were scheduled to speak. Bill Warner most likely would have spoken about the persecution of Christians throughout the world, due to the silence of their leaders. Imagine a Christian University refusing to acknowledge Christians being beheaded, or burned alive in cages by Muslims because of their refusal to become one. John Guondolo instructs law enforcement across the country on the dangers of mosques and the role they play in indoctrinating and supporting terrorism. This among many other topics Muslims portray as untrue, yet is articulated with facts and known cases within the United States. Cathy Hinners, (myself), would have spoken about those Islamists within the state of Tennessee, and their infiltration into our children’s education, our faith and our security. Those literally in our own backyard, with Paul Iesa Galloway and Daoud Abudiab being among two of them. Interesting note, Paul Iesa Galloway insinuates himself as being able to shut down this event, knowing he would be exposed..again. Mr. Boone rightfully has been deluged with phone calls and emails from those expressing their displeasure, however it undoubtedly changed his mind or his belief. While in his responses to emails, he denies being pressured, and quotes biblical, love your neighbor passages, but fails to understand the gravity of his actions. Perhaps Mr. Boone should ask himself why Muslims are so afraid of what will be said. It isn’t about hate or bigotry, it is about truth, the one thing Muslims do not want anyone to hear. Dr.Bill Warner, Ph.D.,: Using the Right Words – Language and Doctrine is a respected expert on political Islam. As an international speaker, author, and video blogger, Warner analyzes Islamic doctrine using scientific methods and evaluations from the Islamic Trilogy of the Koran, the Sira, Mohammed’s biography and the Hadith, the traditions of Mohammed. Warner founded the Center for the Study of Political Islam (CSPI) to further explore and educate about Islamic ideology and its ramifications for Western Civilization. Cathy Hinners :The Threat in Our Backyard is a decorated, retired police officer of 20 years. While active, she developed a course on Middle Eastern Crime, Culture and Community and delivered it to thousands of law enforcement officers across the country. Hinners was also a contract instructor with the U. S. Department of Homeland Security’s Center for Domestic Preparedness, delivering training to the National Guard, New York Police Dept. and other law enforcement agencies on Weapons of Mass Destruction and bomb recognition. In June of 2015, Cathy was named by the Southern Poverty Law Center, along with 11 other women, who speak out against the implementation of Sharia law in the United States. Cathy is the founder of dailyrollcall.com. John Guandolo :Understanding the Threat is the Founder of UnderstandingtheThreat.com, an organization dedicated to providing strategic and operational threat-focused consultation, education, and training for federal, state and local leadership and agencies, and designing strategies at all levels of the community to defeat the enemy. 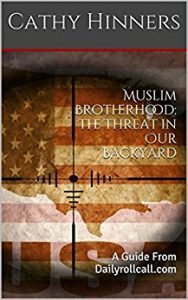 ← Previous Previous post: Muslims Divide America Under The Guise of Religion. Next → Next post: The Erosion of Free Speech by Muslims in America. I disagree with the claim that CAIR pressured the school, I’ve not seen any reports indicating that the initial calls raising concerns with TNU were a result of them, but from calls from Alumni of the school once the speaker list was released. Keep in mind that for many of these events, venues often don’t hear about a final speaker list until mere days before an event and the venue is booked weeks, if not months, in advanced there was simply no way for TNU to vet the speakers initially. Further, there are other factors at play, I’ve authored a piece on SteemIt: https://steemit.com/trevecca/@swillia90/a-pastoral-perspective-on-trevecca-nazarene-university-mae-beavers-and-islam offering one possible perspective to things in this matter. Regardless if any of what I’ve written was a reality, sooner or later they would have become issues for the school and the Church of the Nazarene. I’d ask people to stop and really consider such possible perspectives and truly separate out the subject matter. “It is my belief that this is anything but the case, largely due to huge and glaring misconceptions surrounding Islam, politics, the university system, the mission and vision of the school, the Church of the Nazarene, and theology in general.” Troubling statement from your article, Elaborate. Do you profess to be an authority on Islam? Folks would appreciate a reply. You should ask Hermitage Church of the Nazarene’s pastor who he voted for 6 yrs ago, look at the agenda that president pushed (abort children, gay rights-not so much human rights, and the pulling of America’s building block from government) and then ask yourself this question again about the Nazarenes around Nashville, what they believe or support. This isn’t about tolerance or loving your neighbor my friend and certainly isn’t a patriotic stance neither as Senator Beavers was doing. Just now reading this. People with their eyes open on islamic influence, indoctrination, assimilation and flat out pushing it on society, what platforms would you say we have to stand on besides voting, to voice against and stop?